Say hello to the primal classic, the Werewolf. The concept of people changing into animals has existed since prehistoric cavemen days, as every culture has a form of a shapeshifter based on the region that has the dominant predator. 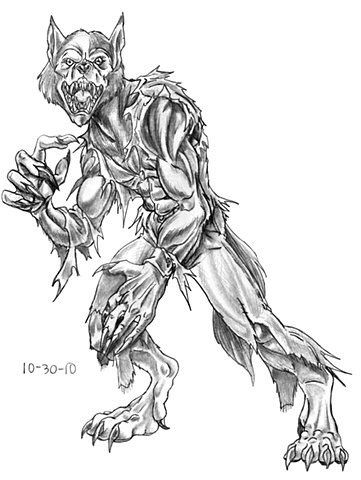 From were-jaguars to were-hyenas, the werewolf is a staple of horror lore. Possible links to the legend can be found from a tale in Ovid's Metamorphosis, where the ruler, Lycaon tested the gods by killing his son and serving it as stew to the gods. The Gods, enraged, cursed him by turning him into a wolf, an origin for the name Lycan. Another staple were the Nordic berserkers; men who wore animal skins and whipped themselves into a frenzy before combat and were described as just as vicious and violent as the animals they dress as, to skinwalkers, a class of shaman who wear the skins of animals to take on their form. The werewolf has served as a symbol of gluttony, of avarice,and recently, as a symbol for conservation. The werewolf is a play on man's primal instinct, that desire to exist outside the fringes of society to a more atavistic nature, the idea of raw power and losing oneself to the inner beast. It is both a blessing and a curse as the benefits and the risks go hand in hand. Some transformations involve a salve, or a wolfskin belt often with a demonic pact, but others it is passed on via a bite or a scratch, and on some occasions, it is genetic. A werewolf is always suffering, from the beginning transformation to its reversion to human form and realizing what it has done the night before. "He should be dead within 30 seconds. The werewolf heart is about two-thirds the size of a human's. But in order to shrink, first it has to stop. In other words, he has a heart attack. All of the internal organs are smaller, so while he's having his heart attack, he's having liver and kidney failure too. If he stops screaming it's not because the pain has dulled, his throat, gullet and vocal chords are tearing and reforming. He literally can't make a sound. By now the pituitary gland should be working overtime, flooding his body with endorphins to ease some of the pain, but that too has shut down. Anyone else would have died of shock long ago. But it won't kill him and that's the thing I find most remarkable. It drags him through the fire and keeps him alive and even conscious to endure every second. Nothing like this could just evolve. This... is the fingerprint of God. An impossible lethal curse spread by tooth and claw, victim begets victim begets victim. It's so cruel, it's... perfect." There are many stories, some claimed to be fact and others fictional, but the legend of the werewolf will live on, because, we want it to. In designing my werewolf, I did the version I prefer, more wolf than man. I made the head more wolf than the classic man-wolf designs, as I like the eyes and fangs. I made the body a tad long, as well as the arms. This is to allow it to alternate between running on twos and fours. The feet were made more wolf, but kept the heel a little close to the ground, as to keep a small aspect of humanity. I added the tail, but made it more as a decoration, a vestigial limb on an otherwise solid beast. The tattered clothing is all that remains of the former person within the skin. The claws and wolfen features are thanks to my previous drawing to the volcarat, as that really helped in shaping the claws, limbs, and face. Based on the lengthy description, it comes as no surprise that the werewolf is a personal favorite of mine, as it is a creature that can be played as a vicious killer, an unfortunate victim of circumstance, or a noble beast. Its a fun character to draw in the end and I figured I do just that. My last drawing will come as no surprise to anyone, but it will be a fun take on the character, nonetheless.